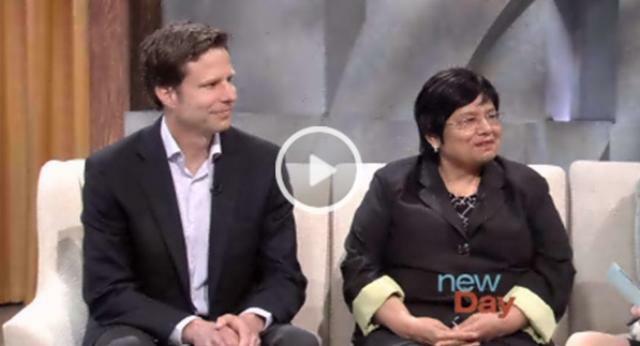 Steve Kipp of Comcast and Estela Ortega of El Centro de La Raza were guests on the May 1 KING TV New Day Northwest program. Click on the picture to go to the program's page and see the segment. KING TV’s morning talk show, New Day Northwest, featured the subject of Comcast Cares Day during one of its segments today, May 1. KING’s Margaret Larson interviewed Estela Ortega of El Centro de La Raza and Steve Kipp, vice president of communications for Comcast in Washington. You can click here to go to New Day’s page and hear what everyone had to say. To see a set of photos on Flickr that capture some of the activity on Comcast Cares Day, click here. More than 2,200 Comcast employees, friends and family members volunteered throughout Washington. You can read more and see photographs and video of the various 2012 projects here.